The term “Government bailout,” which many view as a modern concept, has long existed in the national vocabulary. In fact, throughout America’s history a number of individual citizens have stepped in to help stabilize the nation’s faltering economy. One of these benefactors, financial titan John Piermont (J. P.) Morgan, personally bailed out the United States government, the New York Stock Exchange, and the city of New York at the turn of the last century. The details of these transactions provide a fascinating context for the events leading to the subsequent revolution of the nation’s financial market. Even more compelling, they give people a glimpse into the life of one of America’s wealthiest sons. During the Gilded Age of the 1890s, the United States government was straining under the weight of rising unemployment, falling prices, and a rapidly depleting Treasury reserve. Foreign investors, worried about a weakening American dollar, sold more than $300 million in American securities and moved the gold overseas. As the treasury continued to hemorrhage, losing nearly $2 million a day, and the government steadily approached a financial default, the public began to panic. Only a handful of the richest Americans, known as the “Financial Titans,” could afford to help the government. 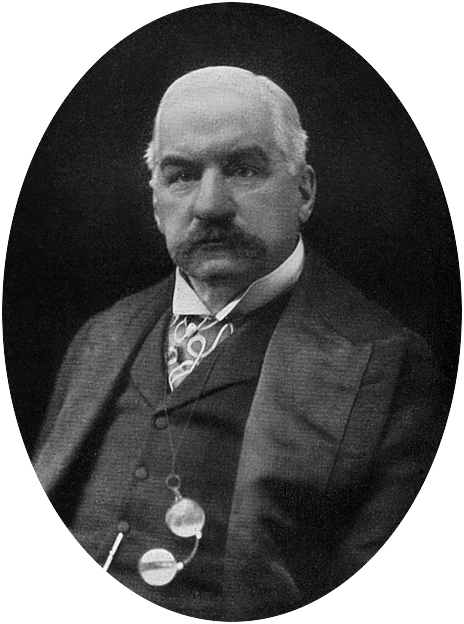 Among these potential saviors was J. P. Morgan, who unfortunately had a reputation for self interest, and many balked at asking him for help. President Grover Cleveland, already an unpopular president, was afraid of generating more public outrage by involving Morgan, so he attempted to find a solution that did not involve him. President Cleveland negotiated a plan to sell government bonds to raise $60 million. However, the plan unraveled when people discovered that the Treasury reserve was down to $9 million, and a creditor possessed a draft worth $10 million. The government was on the verge of insolvency. Behind the scenes, Morgan realized that the viability of his personal empire in the railroad industry depended upon a stable government. He proposes a scheme in which a bevy of foreign bankers could purchase a new bond issue backed by the government in silver or gold. When news of his plans leaked, the run on financial markets slowed, and President Cleveland half-heartedly agreed to meet with Morgan. Morgan offered the president a deal. He would provide the government with $100 million in gold to refill the Treasury’s coffers, for the price of government bonds. Citing a forgotten Civil War statute, he reasoned that the government could accept a bailout in gold coin, making the arrangement legal. The deal was struck and the financial markets stabilized. In a matter of hours, Morgan had saved the United States. In October 1907, the nation’s economy again began to falter. During this three-week period, known as “The Panic of 1907” or the “Knickerbocker Crisis,” a failed stock bid led to a run on banks and trusts, and the Knickerbocker Trust Company collapsed. The resulting panic began to spread and continued for weeks until Morgan stepped in to help. Because the United States had not yet established a central bank or oversight structure, Morgan took it upon himself to arrange a solution, conferring with fellow banking leaders to determine a course of action that would cover bank deposits at the Trust Company of America. Anecdotal records indicate that Morgan invited the presidents of various trusts and banks to his home, locking them in the library until they agreed to provide loans to the company. Although they averted the immediate crisis, the situation negatively affected the New York Stock Exchange, which due to lack of short-term loans to cover stock purchases, ran out of funds. Morgan again came to the rescue, raising $9.7 million to keep the exchange open and clearing the way for the development of the Federal Reserve System. In the midst of the stock exchange crisis, one of Morgan’s associates received word that the city of New York had failed to raise sufficient funds through a bond issue to avoid bankruptcy and needed at least $20 million to stay solvent. New York’s mayor quietly appealed to Morgan for help, and Morgan agreed to purchase $30 million in city bonds, thus averting a city-wide crisis, as well as potential national fall-out. Critics of Morgan are quick to point out that the principle beneficiary in his business deals was always himself. According to many, he did not act out of altruism when he loaned money to the government, the stock exchange, or the city. However, his detractors are equally quick to point out that it was Morgan’s financial acumen that enabled him to save the financial markets. His dealings with the Treasury department were handled as business transactions because he was a businessman. While this may have earned the scorn of modern altruists, it is clear that without Morgan’s involvement, the government would have crumbled. J.P. Morgan’s influence in the early history of the United States is undeniable. His money stabilized a faltering economy, he averted financial panic, and he quietly rescued a city’s finances. Whatever the motivation, the United States would be a far different place without his intervention.